This year, with my trip to Takamatsu, I was not really capable of doing a lot of hanami. While I was in Takamatsu, the weather was too cold and all of the cherry trees were still completely bare and without any buds on them. There were still a few plum trees that were blooming so it wasn’t a complete loss, but there were no spectacular cherry blossoms either. I took the opportunity of having a few days off before I return to work and decided to enjoy the decent weather and head to Meguro. 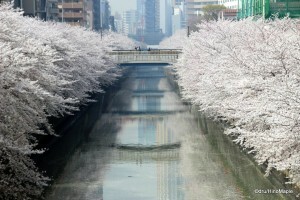 It is on the top 5 list of the best places in Tokyo to see the cherry blossoms for free. I have been to many places in Tokyo, notably Shinjuku Gyoen, Ueno Park, Sumida River Park, and so on. Meguro has always been a place that was far away from me. I used to live in Shinjuku where Meguro was a pain to visit involving a walk to Shinjuku or switching trains. Now that I live on the east side of Tokyo, it is more of a logistical problem than anything else. With so many people recommending me to visit Meguro and the Meguro River, I had to go there once to see the cherry blossoms before I left Japan. When I arrived at the river, I was greeted with a sea of pink on both sides of the river. I thought that it was really nice and a great place to see the cherry blossoms. With the sun out, it was obvious that there was going to be hundreds, if not thousands, of people taking pictures of the cherry blossoms over the river. I thought it was nice but the river was very dirty and brown. It ruined the feel of the cherry blossoms for me. In fact, after learning about the cherry blossoms in Waseda, I think the Meguro blossoms are a pale comparison. Even Rurosha should agree. You can even see her own report about the Arakawa Line and the cherry blossoms on her blog. If you want, you can even head to my post from last year, 2012 Hanami (Cherry Blossom) Report to get more information as well. I doubt I’ll go back to Meguro unless someone has a nice party to go to. I wouldn’t mind going back to Waseda and the Kanda River again, but that may not be for a while. 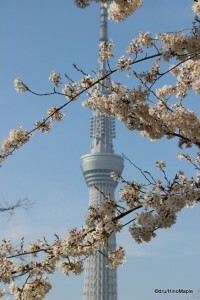 For now, I’ll be content with my local Kinshi Park and the views of Tokyo Sky Tree with it. This entry was posted in Sakura (Cherry Blossoms), Tokyo and tagged Blossom, cherry, Cherry blossoms, hanami, japan, Kinshi Koen, Kinshi Park, Meguro, Meguro Gawa, Meguro River, Megurogawa, Sakura, Shinjuku, Shinjuku Gyoen, Sumida, Sumida River Park, tokyo, Tokyo Sky Tree, Ueno Park by Dru. Bookmark the permalink. 2) that I’m not the only person who’s underwhelmed by Meguro. The walk along Kandagawa between Edogawabashi and Waseda (and even all the way to Takadanobaba) is much nicer. Me too. Glad I caught a bit of it. I don’t know why so many people rave about the Meguro River. It is nice but not like the Kandagawa.